Students will put their hands into the mystery box and describe the mysterious thing in it. The others will ask questions to guess what the item is. With the mystery box, you will have a fun time with students in your English speaking class! 1. Students will be able to use vocabulary to describe items. 2. Students will be able to ask and answer yes-no questions with be-verb. 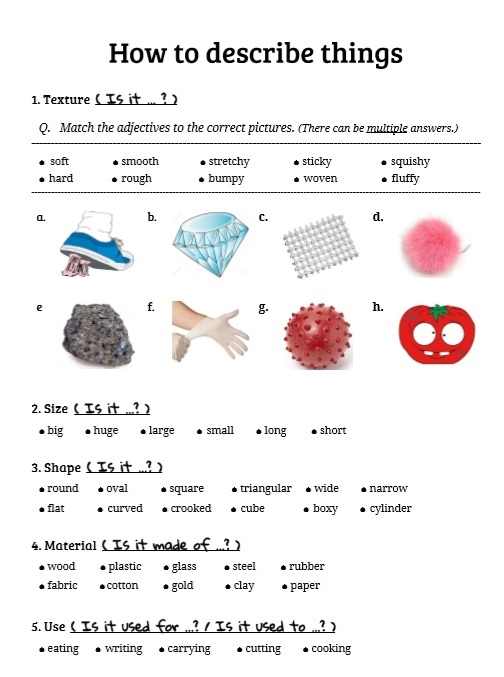 : Preteach vocabulary about size, shape, texture, and use. Students will use them during the game. : Have a student come up to the front and put her hand in the box. She has to describe the object to the class by TOUCH alone, while everyone else guesses what it is. : Students will play the game in a group. They take turns reaching in the box and feel the objects. As one student feels it, the others ask questions about size, shape, texture, use of the items. When students correctly identify the item, remove it from the box.